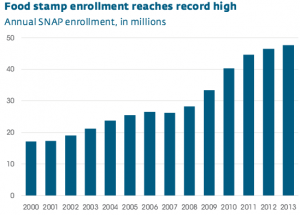 One of the largest and fastest-growing welfare programs in the federal budget is food stamps. While federal law traditionally states that non-disabled childless adults only qualify for food stamps for three months out of any three-year period unless they meet specified work requirements, in many states that stipulation has been waived. – In 2015, 42 states waived work requirements for those on food stamps. – 13 states have partial work waivers covering only parts of the calendar year or specific regions of the state. – Work waivers have been shown to perpetuate poverty and trap recipients in government dependency. The number of people receiving food stamps has quadrupled since 2000, costing the federal government $80 billion in 2013 alone. This heavy drain on the federal budget puts other critical spending priorities at risk, stalls economic growth and contributes to the perpetuation of the welfare state. – In 2013, three-fourths of childless adult households receiving food stamps had no earned income. – After work requirements were enacted, less than five percent of able-bodied childless adults qualified for food stamps. – Less than three percent of all non-disabled, full-time, year-round U.S. workers are in poverty, compared to nearly 33% of non-workers. – Childless adults receiving food stamps in the early 2000s exited the program within a year when a work requirement was implemented. Many statesꞌ work requirement waivers will expire in September 2015. By January 1, 2016 those who fail to meet work requirements will begin to cycle off of food stamps. If governors across the nation do not extend the waivers it is estimated taxpayers will save between $6 billion and $8 billion annually. Hopefully, U.S. officials will seize this opportunity to restore the working class, spur economic growth, and reduce government dependency.